The 2017 Lexus RX and 2017 Acura MDX are two very popular luxury crossovers. Both crossovers have the flexibility to transport cargo and people in a stylish and comfortable package. Each vehicle also has a wide range of amenities intended to appeal to a broad variety of consumers, with plenty of trims tailored to fit multiple budgets. Clearly the two competing vehicles have a lot to offer and the choice is entirely subjective and depends on which choice best fits a prospective buyer’s needs. 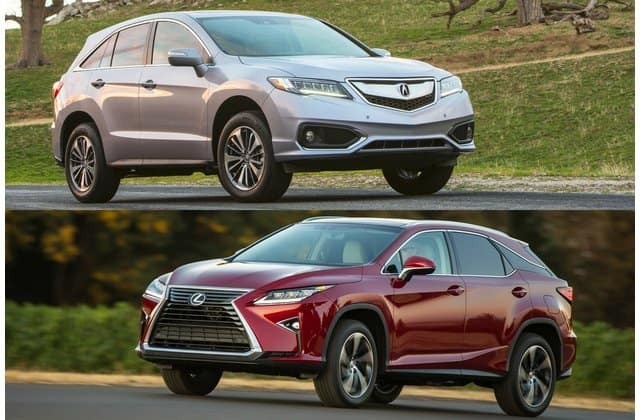 Let’s take a closer look at the 2017 Lexus RX and 2017 Acura MDX to see how they fare in a head-to-head comparison. When it comes to safety both crossovers exceed expectations – both the Acura MDX and the Lexus RX are Insurance Institute for Highway Safety Top Safety Pick, both earned the highest rating of Good in all crash tests, and both received Acceptable ratings for headlights. The Acura MDX was also rated as Superior for its available crash avoidance technologies, while the RX offers a better LATCH system with additional positions. All in all, these two are well-matched vehicles when it comes to safety. If prospective buyers are searching for a true people mover then the Acura MDX is the one. Offering standard seating for seven passengers, the Acura MDX has a 60/40 split-folding second row that slides forward and back roughly six inches to provide legroom for the third row when it’s in use. When the third row is unoccupied, the second row becomes considerably expansive – reclination included. Captain’s chairs for the second row are an available upgrade on the MDX. On the other hand, the Lexus RX comes standard with seating for five passengers and a 40/20/40 split-folding rear bench seat with added flexibility for cargo. Select trims do offer a third row of seating at an additional cost and include the option of second-row captain’s chairs. EPA-estimated fuel economy for the 2017 Acura MDX equipped with front-wheel-drive is 20 mpg in the city and 27 mpg on the highway. Those figures take a small dip by one mpg when buyers choose an all-wheel-drive MDX. The Hybrid variant of the MDX offers 26 mpg in the city and 27 mpg on the highway. EPA-estimated fuel economy for the 2017 Lexus RX equipped with front-wheel-drive is 20 mpg in the city and 27 on the highway. When equipped with all-wheel-drive the Lexus RX has an EPA-estimated fuel economy of 19 mpg in the city and 26 mpg on the highway. The hybrid variant of the RX boasts a fuel economy of 31 mpg in the city and 28 mpg on the highway. Both crossovers are more or less within the same fuel-efficient ballpark, so once again this is more a matter of taste. The Lexus RX offers standard features such as an 8-inch screen and a 9-speaker premium audio system, Available upgrades include navigation, a 12.3-inch touchscreen display, a remote touch navigation controller, a 15-speaker Mark Levinson audio system, and the Lexus Enform App Suite. Standard on the MDX is an 8-inch screen display as well, accompanied by an 8-speaker audio system. Upgrades for the MDX include a 12-speaker ELS audio system with navigation, although the touchscreen display remains 8 inches with nothing larger offered. Apple CarPlay and Google Android Auto Connectivity capabilities come standard on the MDX and are not available at all on the RX. While the RX offers more upscale features, the MDX has better smartphone integration. Ready for your test drive? Visit Driver’s Auto Mart today to get behind the wheel of any of the previously listed vehicles. Prospective buyers can browse our wide selection of used car inventory to find their next car!